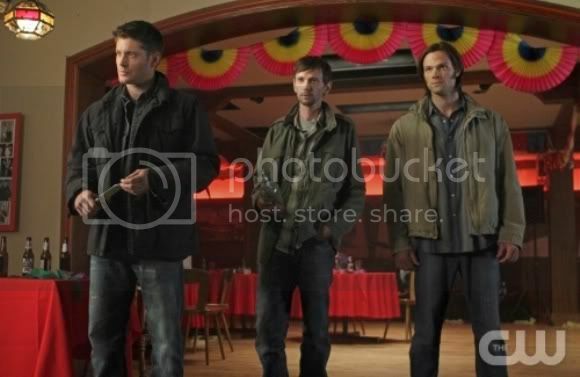 Quick Take: Supernatural, "Season 7, Time for a Wedding"
(S0708) Don’t let the groan-inducing title or the completely unappealing promo fool you: this episode is a good deal better and smarter than it's being given credit for. After a second, less apprehensive viewing, I’ve come to the conclusion that this might just be the most bipolar episode of Season Seven in fact, and possibly the whole series, yet. The parts that are bad are really really bad, but the parts that don’t make me want to set the television on fire are surprisingly insightful. With that said, I still despise the character of Becky Rosen and beg of the writers not to inflict her madness on us again. For those unfamiliar with Supernatural’s mind-bending meta-ness, the show as we know it exists in-universe as a series of poorly-selling fantasy novels penned by a prophet named Chuck who didn’t realize that his story ideas were completely true. Despite the poor sales, the books have quite the dedicated cult following, complete with cosplayer-filled conventions and rabid fangirls on parade. I’ve always been torn by the “fandom” as presented in the Supernatural universe. On one hand, the books and the fans are clever and fun, but seven seasons in, I still can’t entirely tell if they are meant to be a wink-wink-nudge-nudge from Supernatural to the rest of us, or a passive aggressive way of mocking the chicks who show up at conventions wearing wedding dresses. …which is pretty much what Supernatural manages to accomplish in record time during Season Seven, Time for a Wedding. The infamous Becky is back…as Sam’s Twitter-obsessed, love-potion abusing wife. She drugs Sam, marries him, and drags him off to be the show-and-tell subject at her 10-year high school reunion. When the stuff starts wearing off, she meets up with her Wiccan friend, Guy for more and Guy reveals himself to be a crossroads demon. Those first few hits were on the house, but now it’s time for Becky to pay up. Sure, in the end, she makes the right decision, but it takes a lot of cringe-worthy exposition to get there. Despite her outgoing personality and generally perky (almost annoyingly so) demeanor, Becky sees herself as a loser. She’s always been a loser, she tells Sam (who, by the way, is tied to the bed in a scene reminiscent of the one in Misery, another tale about a deranged fan). Her nickname in high school was “Yucky Becky” and the only place that people understood her, she says, was the message boards. She says that she always related to Sam because he thinks of himself as a freak. She only wants someone to love her for her, and she doesn’t understand why that someone can’t be Sam. At the conclusion of “Season 7, Time for a Wedding,” the Winchester-Rosen union is annulled and Becky finds herself in the doe-eyed sights of Garth (DJ Quallis as a woefully underused, chilled-out hunter) implying that maybe, just maybe, she has found someone who will love her for her. That’s a nice, though somewhat condescending message, but the problem is that 99% of Supernatural fans don’t need to hear it and the 1% that does is too busy tracking down Jared Padalecki’s phone number to pay attention to it. MaryAnn was raised by television because her parents were too cheap to get a babysitter. Some people have fond memories of summer camp, she has Salute Your Shorts reruns. Stalk her on Twitter at @radium_girl. When is "gourmet buffet" NOT an oxymoron? The "origin myth" sounds similar to how the Dark Tower series evolves in part, with Stephen King himself inserted into the story.